Winter can be challenging for veteran horses, especially once their dental function starts to decline. Adjusting the diet to ensure enough chewable fibre intake and enough energy for condition can take some juggling. In addition, over winter when grass is sparse, essential micronutrients should be elevated and a good intake of antioxidants ensured. Our horses are living for longer nowadays, which is attributable – at least in part – to better healthcare and nutrition. Horses and ponies don’t become ‘aged’ at a set age, but tend to be classed as ‘aged’ once they show several signs of ageing, and this can vary from the late teens up to the 30s, depending on the individual. Signs of ageing can include sarcopenia (loss of muscle mass), less efficient immunity, musculoskeletal disease such as osteoarthritis (OA) and a decline in dental function and associated weight loss. 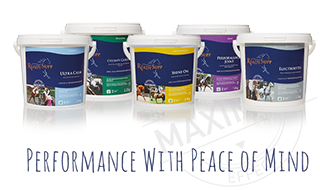 Feeding the veteran horse needs to be assessed on an individual basis, to ensure that the older horse who doesn’t show much if any signs of ageing is not overfed! If an aged horse is maintaining their condition and does not have age-related special needs, they should be fed as a regular adult, with slightly elevated micronutrient intake. · Loss of condition despite ad lib forage and regular amounts of concentrate feed. In the early stages, a short chop hay replacing forage can be fed, which should ideally be based on soft dried forage. Hay (or haylage) should be replaced weight for weight. As dental function declines further, soaked ground fibrous forage replacement feeds will be required. These feeds need to weighed and the horse fed appropriately. A 500 kg horse who can no longer eat any hay or haylage and whose paddock had run out of grass (for example, in January) will need 8-9 kg of these feeds daily, ideally spread between 4 meals (or at least 3). Introduce and increase up to the maximum amounts gradually. The actual amount of feed required will be determined by the horse’s condition. If unfortified straights are fed – including grass, alfalfa, and sugar beet – a multi-vitamin and mineral supplement with good levels of antioxidants should be fed as well. Veteran horses do not have to be thin – this is not a normal part of ageing. They simply need to be fed enough fibre and energy (calories) in a form they can chew and swallow. They need extra care during winter when grass availability drops since many can manage to chew grass but not hay or haylage.